Now Published by Springer This exciting new journal provides a timely forum for the rapidly-expanding field of the rule of law, encapsulating cutting-edge study from all related disciplines. This unique centre for the exchange of views between academics and practitioners gives focus to the promotion of the rule of law on both the national and international stage. The journal aims to deepen and broaden the knowledge of the rule of law and its relation to economic growth, poverty reduction, promotion of democracy, protection of human rights and geopolitical stability. 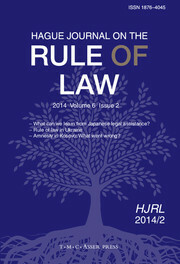 The journal invites and will publish academic articles, practitioner reports and commentary, book reviews and special volumes on major developments and themes in the rule of law field.